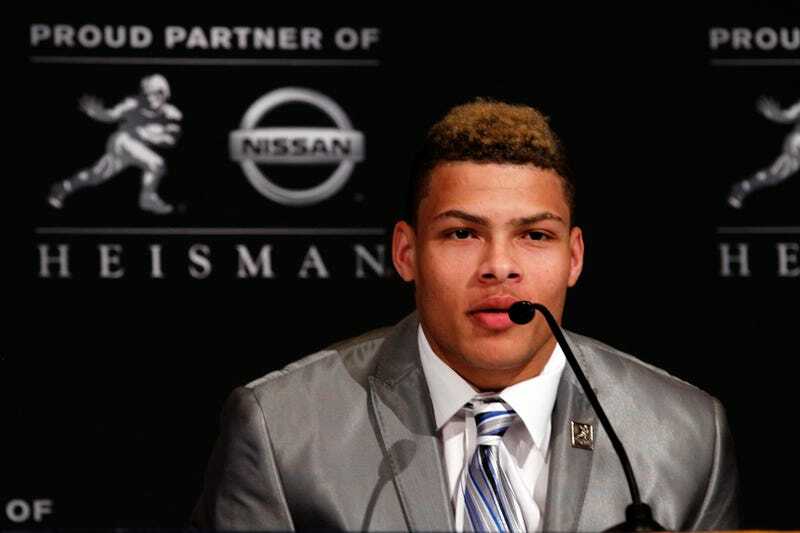 Will The Honey Badger Be Playing For LSU Next Season? Tyrann Mathieu's suspension from LSU wasn't your average suspension. LSU announced their ruling in a mysterious, intentionally opaque press conference, and their reasons for waving goodbye to their best player were never fully divulged. Whatever the reason, the farewell seemed permanent: four days after the press conference in which LSU head coach Les Miles announced Mathieu's dismissal and said, "We are going to miss him," LSU's NCCA compliance director Bo Bahnsen told USA Today, "He's permanently ineligible to play football at LSU. That's definite. That's what was said Friday." [CORRECTION, 5:27 p.m.: LSU senior associate AD Herb Vincent refuted Bahnsen's statement shortly after it was made in this tweet, and followed up with the (non-) clarification, "To clarify: Tyrann Mathieu has the option to go to LSU as a student. LSU is not speculating on his football future."] Mathieu, a Heisman finalist as a sophomore, would have to spend his junior season in purgatory as he navigated the NCAA's labyrinth transfer policy and tried to determine whether his violation of team rules would keep him off the field if he went elsewhere. That's Miles on the Scott Van Pelt show, being asked by Ryen Russillo whether Mathieu could have a "happy ending with the LSU football family." It's an intentionally vague question that begets an answer that sounds like word soup even coming from an SEC football coach: Miles says that there's a "very legitimate chance," but goes on to say that he thinks that the "point of degree and the point of handling your business and making sure everything's right and correct and getting your feet on the ground—I think that that is a tremendously happy ending." Whatever that means, a happy ending for Mathieu and the LSU football family is Mathieu playing football for LSU, and Miles seems to think it's on the table. That outcome may have seemed likely that when Mathieu didn't immediately transfer (in August, after Mathieu toured multiple FCS schools, it looked like Mathieu might take the Da'Rick Rogers route) and now that Mathieu is re-enrolled at LSU and Les Miles is talking about happy endings, it seems all but guaranteed that Mathieu will be in the secondary for the Tigers next season. To recap: On August 10, Les Miles and the LSU athletic department declared Tyrann Mathieu suspended for the season. Asked why, they wouldn't answer. Asked whether Mathieu violated team rules or school rules, Miles said both, but Mathieu was only suspended from the team, not from the school. LSU's NCAA compliance guy said Mathieu was never coming back, and that the decision was "definite." Many said Mathieu was off the team for drug violations, but as noted here, that explanation only raised more questions. On August 17, a week after the press conference and three days after LSU said Mathieu would never play another down for the Tigers, his father told FOX 8 in New Orleans that his son had entered a drug rehab program and would be there for as long as took to get clean. On September 8, Mathieu was in the student's section [Note: A reader who attended the game says Mathieu was actually in the season ticket holder's section] at LSU's week two game against Washington. Now, as long as Mathieu takes care of "the point of degree and the point of handling your business," he's probably back on the squad, and LSU can continue conducting its business like the Kremlin. Let the healing begin.